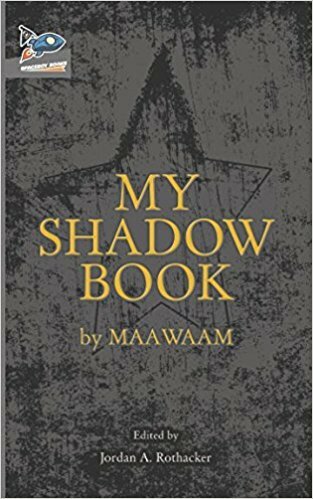 My Shadow Book, ostensibly written by the supernatural creature Maawaam and edited for publication by Jordan A Rothacker, is a study in contrasts. Purple-prosed in places, superficially light in others, it plays with several literary concepts. It may be trying to make a point about literature. Ultimately, whatever the message, the book falls short of delivering. This epistolary novel has become a cult staple in literature, particularly the paranormal genres. From its beginnings in the Victorian era (Dracula by Bram Stoker) to more modern iterations (E by Matt Beaumont), the method of giving the reader a narrative through diverse storytelling media keeps the story fresh by using multiple points of view, each with a varying degree of reliability. Likewise, another staple of 20th Century genre fiction is the “found manuscript” style of writing. These, so the stories invariably go, are not the work of the “editor,” but rather are an archival document left by the author for later publication. Many authors—George Macdonald Fraser in his Flashman series, for example—use this to lend their work an added air of authenticity. My Shadow Book combines both these literary conceits of the epistolary novel and the found manuscript to tell the story (the term used here loosely) of an unknown author who, through diverse scribbles on scraps of paper stuffed in a box and forgotten, writes of his belief in Shadow Men and Women, a dark cabal of famous literary icons who were engaged in... Well, it’s never really said. Over the course of the novel, we learn nothing about whom or even what the Shadow Persons are, their mission, or their purpose. The books starts out deliciously creepy, but this mood is not sustained. We meet the unnamed author, through whom Maawaam speaks, learn some personal history, are treated to a very great deal of rambling about how the Shadow Persons do something or other in the shadows, but we never know what this actually is. Oh, it’s terribly dark and nefarious: we know because we’re told so. We eventually learn that the author has come to the realisation he is a Shadow Man, and can “communicate” with other Shadow Persons through reading their literature. They leave traces only he can see. On the face of it, this could be wonderful method of showing that the “author” is suffering from schizophrenia, following him down an ever-deepening rabbit hole of mental illness. But it doesn’t happen. Because, in the end, nothing happens. This is the book’s greatest downfall: a lack of purpose. At first the short scraps, ramblings really, are read avidly as the reader searches for that key which will begin to bind them into a narrative, a unified whole (from a certain point of view). But this key never arrives, and the reader is treated to a lot of reinforcement about how weird the Shadow Persons are, but nothing about why they exist, who they are or why this is all important enough to be paid any attention. Granted, it is not necessary to explain every facet of the Shadow Persons’ being, their history or their culture; but in order for the narrative to form, the author must tell us their purpose. The use of “found documents” does not let an “editor” off this particular hook, nor does it give license to poor plotting. The second half of the narrative is markedly different from the first. Where the story begins with scraps of rambling statement, we are treated in the second half to an excerpt of a novel, underwritten with notes by the “author,” in which we are given two possible first chapters of a novel about a character learning his “secret name.” The differences between these alternate chapters are marked but linked, being about the same character in two wildly different settings, but we never learn the reason. Was the “author” struggling, until the supernatural Maawaam showed him how to write it properly? We don’t know, we’re not told or shown. The reader has no idea what is going on, it’s effectively gibberish. Subsequent chapters of this book-within-a-book are coherent, but unfortunately bland. The character in the internal novel gets handed a book and we are treated to the novel experience of reading a book-within-a-book-within-a-book. This could be genius. Unfortunately it doesn’t teach us anything or alter the events of the overarching book, so we must ask: why? Not so much a shadow book as a shadow of a book.